This uncomplicated gooseberry wine recipe produces a light, medium dry wine with the sharpness of gooseberry. Try to use small, green gooseberries from early in the season. If you use later ones, then increase the sugar and turn into a sweeter wine. 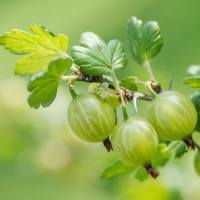 Better known as a dessert fruit, gooseberries make a lovely wine nevertheless. They’re not particularly difficult to grow and gluts can be frozen by just bagging and freezing for a few months until you have time to process them. Top and tail the gooseberries and rinse well. Put into a fermenting bin and crush well by hand or using a potato masher. Pour on 4 pints of water. Add 1 Campden tablet, crushed and dissolved in a little warm water to kill off any wild yeasts. Boil all of the sugar in 3 pints of water for 2 or 3 minutes and, when cool, mix into the pulp. Add the Pectolase, yeast and yeast nutrient. Cover and allow to ferment for a week, stirring daily. Rack, as necessary, adding a Campden tablet after the first racking to stop secondary fermentation. Makes 1 gallon of gooseberry wine. It is usually best drunk a year after being bottled but can take two years to fully develop. You’ll find it usually says on the pack with nutrient – otherwise a teaspoon. With yeast, that usually comes in individual sachets although, with it being a living culture, for 2 gallons of wine say you could use the same amount of yeast and in a day the number of cells would have doubled. Did you use pectolase? If not add some now, it may well rescue. If there are bits floating, strain it again as you put it into the demijohn. Do you have a recipe that would work for red gooseberries? I have a huge amount of last summers in the freezer and would like to make use of them. Many thanks. Not at the moment – you could always try the above recipe and see how it comes out. That’s the fun of making your own! Hi how long will fermentation take place? Mine doesn’t seem to have any bubbles. It’s been in the Demi John for a week! Something is wrong – is it warm enough? Was the yeast very old? Try making a little starter with boiled water and sugar, add the yeast to that and after it is bubbling add that to the demijohn. No, it isn’t normal. It’s stalled for some reason. Try warming it a few degrees and giving the demijohn a shake to see if that works – if not add some extra yeast started in water and sugar. I might have done it all wrong as I poured boiling water over goosberrys as I used to do thirty odd years ago is this method frowned upon now? Not really – the idea of Campden tablets is to kill off any wild yeasts before you start fermenting with the cultivated yeast. Boiling water will do the job so long as the fermenting bin etc is sterile. Shouldn’t there be a pause of more than 2-3 minutes between steps 3 and 5? Doing it this way risks killing off the wine yeast with the Campden tablet doesn’t it? It’s going to be a longer gap than 2-3 minutes – boiling up the water & sugar and letting it cool takes at least a good half hour in my experience. Basically the effect of Campden tablets goes off quickly (there’s a good technical article on Campden tablets on Wikipedia)and whilst I see the logic of your question, in practice this method works. I just saw a couple of comments above about fermentation “stalling”, looked at the instructions and thought that maybe a 24 hour pause between adding the Campden and adding the yeast might help. You can always cover up to prevent wild yeasts getting in during that period. As I basically said, I can totally see where you’re coming from but I don’t think that’s the reason a couple of people have had stalled ferments. If it was the Campden then it wouldn’t have got going at all. What you say about adding a Campden tablet to prevent wild yeasts is backed up by many experienced writers on wine making. But I have also had problems with stalled fermentation and have long given up pre-sterilizing with sulphite. I use the boiling water method instead and have had no problems with this. I prefer boiling myself but you do have to be careful with your hygiene. Hi, made this years ago using this method. Tasted it after a year and it was horribly tart but then won a wine competition with same wine a year later as the secondary fermentation (malolactic) had accidentally occurred. Lucky me. So the moral is to lay down the wine for at least 2yrs. Cheers. Tony Hodgson. I find using a hydrometer just before adding the yeast a very important step as you can determine the level of alchohol that will be achieved before the strength of alcohol kills the yeast and will also you will get a guide on the residual sweetness. If a wine proves stubborn to clear boil 500g of peeled sliced bananas for 20 minutes strain and cool to room temp then add the strained liquor to the wine. This will greatly add to the body of the wine and if left for at least a couple of weeks you should see the wine clearing. I am returning to making wine and beer after a 30 year break. Hi John I’m trying the gooseberry wine for the first time I’ve crushed the gooseberry added the water and the Camden tablet how long after do I add the yeast and yeast nutrients. I wonder if this can be made with a non sparkling yeast or if you’d recommend sparkling? I simply don’t want exploding bottles and don’t want to buy proper champagne bottles. Thanks in advance. Hi Carla – the recipe is for a still wine so you don’t need champagne bottles. It’s the type of yeast that gave a good result being referred to, not the type of wine.